There are times when life pulls you away from your loved ones, but you still want to support them through their most critical moments. Whether you're celebrating an engagement, an elopement, a graduation or your first Father's Day away from home, this galvanized bucket loaded with salty treats and a variety of microbrew flavors will convey the perfect message. It will say that you wish you were there. It will say that you're sorry, that you're in love or that you simply wish someone well. It will say it all in such a refreshing manner that your loved ones will look forward to your next gift. I won't go into all the reasons here, but it's really hard to buy a gift for my mom that she likes. In fact, my sisters and I have a contest each year to see who gets her the best gift. I have to say that not only did I win with this basket, she said "how did you find such a clever gift ...I love it!" That leaves my sisters to fume for another year! Thanks BeerGifts...you really made me look good. Love the arrangement! The galvanized bucket was red!! This was the perfect Valentines Day gift for my husband. He has enjoyed the snacks and almost finished the beer. He wants to take his time so he can enjoy the beer a little longer. Thanks Beer Gifts!!! A very satisfied customer. 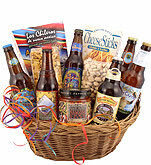 This bucket of microbrews gift arrived on time and included a nice arrangement of beer and snacks. When I placed the order I accidentally entered the wrong shipping address. I emailed customer service and they quickly fixed it for me. Thanks for the great customer service! Beautifully packaged. I bought this for my son for Christmas. He hasn't opened it yet but I'm sure he will love it. 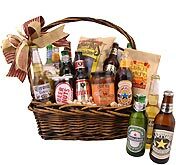 It's the perfect gift for the beer lover. I can't wait to see his face when he opens it. I know I was impressed when I saw it. This was a fun birthday present for a relative who loves to try new microbrews. The package arrived when they said it would, in great condition, with some new and old high quality brews and goodies. Its worth the expense. I was looking for an unusual gift for my brothers-in-law. This was a great and welcomed surprise. Judging by the consumption rate, Iâ€™d say it was a pretty tasty one at that. Great concept guys! My son is in the U S of A for a couple of years and this was a great little gift for him. Website was easy to use even for a silver surfer like me. Bucket of microbrews was really appreciated. Timely Delivery with a quality product. This was a last minute purchase for the person that had everything but this gift. I t is such a good product I will purchase again and again. This was a great way for us to cheer up our son-in-law after he had surgery on his leg. He really enjoyed the variety of beers and munchies. Great company to deal with they delivered when I requested them to. Good product and selection of options. Thanks for sending our friend what we ordered for his Christmas Present. This transaction went very good. Got this as a secret Santa gift. He loved it! This gift was the most bang for my buck! 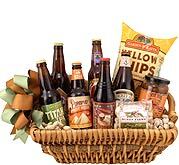 The basket was full of treats and all great beers.